When buying a pair of eyeglasses for your child bring them along. Your child should like how the glasses look and feel. 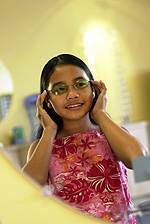 At Fox Chase Family Eye Care, we carry a wide selection of children’s frames including ,Swing, X-games, Kensie Girl, Disney, Specs4us for down syndrome patients and Miraflex for infants.